I am 100%.... no 95%... no 100% sure this is right, but i cant seem to find anything like it, ive gone through the lalique site and many other crystal sites trying to get a name on the pattern and have so far come up with nothing the same as this one. 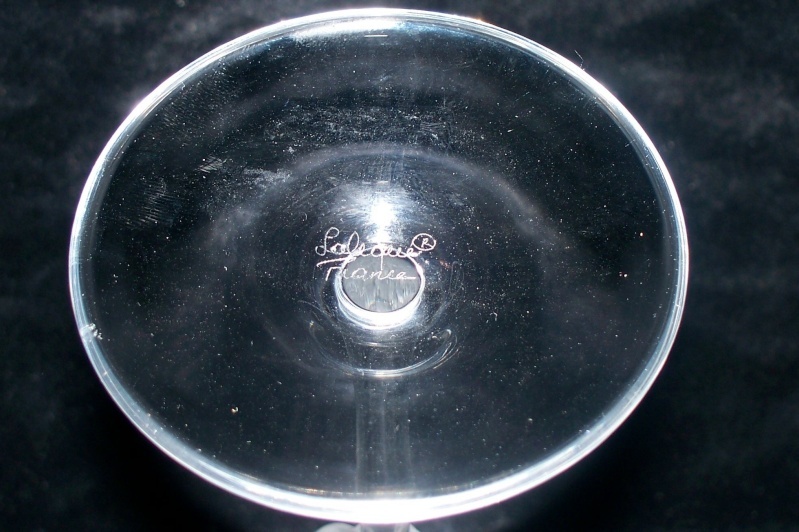 The glass stands at 22.25cms tall, with Lalique (circled R trademark sign) and France underneath. It has a tall thin round stem, at the top of the stem is a "knop" with 2 naked females curled around on some foliage, the base of the bowl has little facets. Not sure be it may be this...fingers crossed! Brilliant....I spend so much time on "replacements" - so glad I could be of assistance! just thought I'd add -yes you are right: Roxane -and the pattern was designed by Marc Lalique the son of Rene. I thought earlier around 1955-60-ish - but they quote 1968 -dates of these designs are quite hard to be precise on - I expect they are right. The r in a circle signature means this example was made after 1976.
thanks Mike every scrap of info helps to build a bigger picture. The glass is in like new condition no surface wear at all, i would imagine its never been used at all. now, you only need another 5 for a set!